The biggest deciding factor that helps our customers choose between our Blaze Cloud VPS and traditional or non-Cloud Virtual Servers comes down a few key topics I discuss with the customer. This blog post will help you identify why the Blaze Cloud VPS should be your first choice every time. Because at the end of the day, hosting is a serious topic and failure to take it seriously only ends is more challenges down the road. What are you hosting now? Most of the traffic that hits our site are prospective customers, some are seeking our free video and knowledge base tutorials, whilst the remaining few are competitors scoping out our product range. After all, it pays to do our research on your strongest competitors. Speaking of our customers, anyone running a CMS or online store will most likely be using WordPress, Joomla, Drupal or Magento. OTS or ‘off-the-shelf’ software is all the rage, also known as ‘turn-key’ software it offers the smallest possible time cost when setting up a new website. The key disadvantage of OTS software is that your site suffers with the size of the application. WordPress is not a piece of paper and a pen, its a full blogging suite inclusive of plugins, SEO modules, rich content and even SKU numbers for those using it as a store. These features do not come cheaply when it comes to resources; nothing in life is free as they say. I see customers launch a WordPress website with no caching, tweaks or image compression, days later they start to reach their resource limits on the VPS to the detriment of the overall server stability. 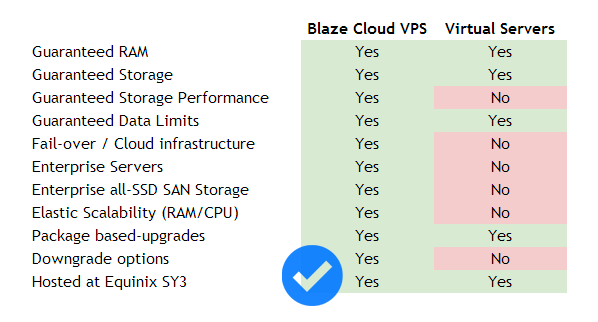 Comparison between our Blaze Cloud VPS and non-Cloud ‘traditional’ Virtual Servers. Correct as of July 2013. Small or ‘low-traffic’ (to which I use the term very loosely) tend to be satisfied by the non-Cloud Virtual Servers as they offer great bang for your buck for the amount of RAM and CPU on offer. However the infrastructure backing the Blaze Cloud VPS is faster and hardware redundant, so the benefits of the Blaze Cloud VPS out-weight the higher entry costs ten-fold. As demands on hosting servers will only grow into the future, its important that you select the most powerful hosting option now, and grow into the server’s capacity and features as your site’s traffic grows. For that reason alone you should always consider the Blaze Cloud VPS as your best option. Planning for the future and scalability. As touched on just prior, selecting a hosting platform that allows you to grow into it is more important than selecting one that meets your direct needs, right now. Sure it’s nice to have a 3G connection on your phone at the moment, but what happens when HD streaming options become available through Telstra or Optus? You’ll need to upgrade to 4G. The same rules apply here, and the same considerations should be taken into account. After all, who wants a 3G phone when the 4G is available and excellently priced? The Blaze Cloud VPS was specifically designed for the changing hosting requirements brought about by the increased Cloud and hosted application usage. 5 years ago it was common for many to discount the viability of hosted applications and Cloud apps, now those same scrutineers are heralding shortened work flows and ease-of-use applications that we now all take for granted. Many of these apps have massive resource demands not only from RAM and CPU, but also storage performance. As we are the only hosting provider in Australia to offer world-class SolidFire all-SSD storage to our customers, guaranteeing your storage performance comes standard (you can even burst up to 8000 IOPs!). Scaling the resources on the Blaze Cloud VPS is easy, and all upgrades are billed on a pro-rata basis. Want 16GB of RAM and 4 CPU Cores? Or perhaps 4GB of RAM and 8 CPU Cores – it’s all up to you. Not only that but you can also choose up to four all-SSD drives for custom disk partitioning. Throw in port speed scalability and a massive list of operating system options including CentOS with cPanel, CloudLinux, Ubuntu 12.04 LTS and Windows Server 2012, and you have flexible, powerful hosting platform ready for any task. Finding the features and feeling its effects.